You’ve done your research and decided that HubSpot is the platform you want for your company’s marketing and sales needs. But to get the most use out of it and to strategize an inbound marketing plan you need a marketing consultant. This makes it imperative that you pick the right agency to partner with, an agency that has experience working with HubSpot and its products. 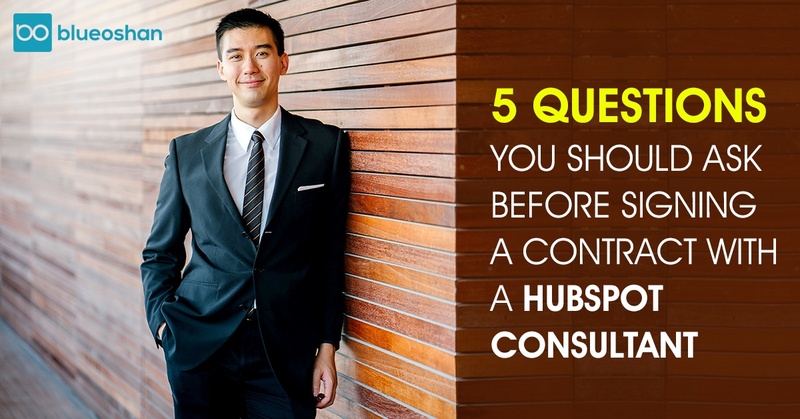 To help you, we have put together some important questions to keep in mind before signing a contract with a HubSpot consultant/marketing agency. How do you apply HubSpot? We are a certified HubSpot partner ready to help with any marketing or sales needs your company may need. What HubSpot certifications do you hold? A scan through the HubSpot website will show that they provide a lot of certification courses. The courses cover a range of subjects—everything from inbound marketing to content marketing—that add value and insight while using the software. So when choosing a HubSpot agency to partner with, pick one where the consultants are up to date with their certifications and keep in touch with the latest happenings with regards to the product and inbound marketing. What services exactly will you provide? Will you strategize as well as execute? There are agencies that will just consult and strategize, and leave you to execute the plans within your company. There are agencies that will manage your account but outsource the creative and content work. Then there are the agencies that do it all in-house. They will have a dedicated team to meet all your inbound marketing needs. You will have to decide what your business’s needs are. Before signing a contract make sure your expectations are aligned with the services that will be provided. What processes do you have in place? When working with an agency there will be aspects such as client communication, collaboration, reporting, billing and project management that are vital to the relationship between you, the client, and the agency. You don’t want these tasks to take up the agency’s time, time that can be spent doing real work. So find out what processes and systems the HubSpot agency already has in place to make the experience of working with them smooth, easy and fruitful. How will you track progress? What are the indicators you use to measure results? All the strategizing and implementing of HubSpot inbound marketing will be for nothing, if there aren’t results. Results are the main reason you hire an agency. So there has to be a clear understanding of deliverables and business results. Yes, the agency and you will agree on certain number of posts a month, and social media campaigns etc. But, the agency will have to provide you with a monthly report of marketing analytics. This report could track everything from website traffic and leads generated, to social media follows and business growth. Instead of fixing on number of blog articles and marketing campaigns created a month, pay more attention to business goals and business related results and make sure the agency you pick tracks that as well. There are other things to keep in mind while picking a HubSpot consultant, such industry experience and pricing, among others. However, the answers to the above questions will help you narrow in on an agency that best serves your needs. We at BlueOshan, a HubSpot certified partnered agency, have worked with companies across industries and provided them with successful inbound strategies and tactics. Contact us to learn more.